“Baby it’s cold outside…” Remember that song? I’m reminded of it every time I venture outside. Weather forecaster are promising much of the same for the foreseeable future, with a snow storm here and there just for good measure. We lucked out with the first Northeaster that just swept the coastline and got away with just an inch or two of snow, but the second storm has not treated us as well bringing in its wake an Arctic blast that apparently is here to stay. So I do what I do best when forced to stay in my studio: begin daydreaming at the easel with my brushes. 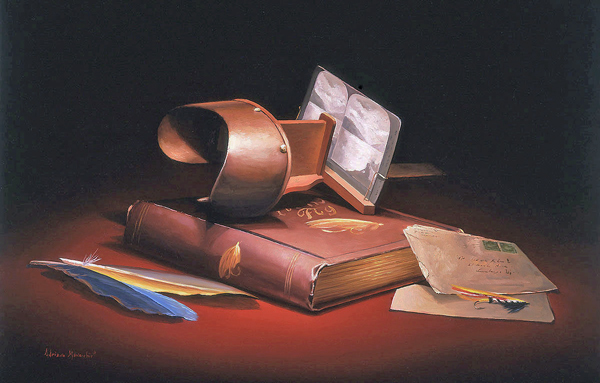 The two still life paintings I want to share with you are two of my storytelling images. “Grandfather’s Favorite Place” found its inspiration from an old stereoscope acquired years ago with the photo of an angler enjoying the beauty of the outdoors. “Grandpa” has just finished reading a letter from his fishing buddy and memories of the wonderful times spent together chasing the elusive trout came flooding back… This oil on panel measures 8.75″ x 11.5″ and comes framed in a custom made gold frame. The subject of the second painting titled “Never Forgotten” might not be as familiar to you as my sporting still life images, but it is one that truly fascinates me. 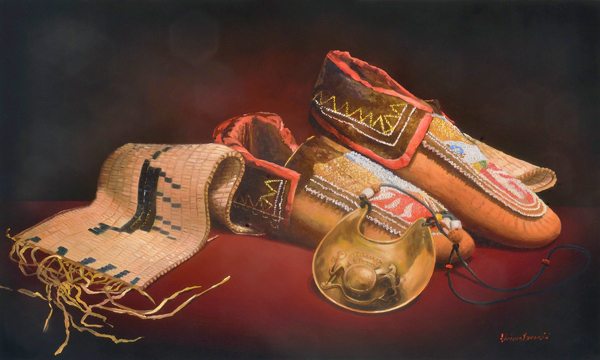 I have painted several American-Indian and Western still life images through the years and they have all been sold. The history of the American-Indian civilization has always held a deep interest for me and I’m especially drawn to their masterful craftsmanship in bead and quill work. The problem with creating new paintings is the limited availability of the right collectible items. Several years ago I had the pleasure and fortune of working with an antiquarian who had a massive and priceless collection of Indian artifacts. This painting is a celebration of their mastery. This oil on panel measures 17.5″x10.5″” and comes framed in a custom made frame. While waiting for Spring embrace Winter and all the wonderful gifts it has to offer.